This is another contender for the good idea/bad idea category, but I have to admit that personally, I'm still on the fence about this one. What do you think? 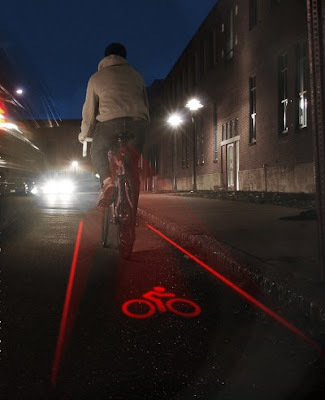 It's a lighting system that projects a moving bicycle lane down on the pavement around you. 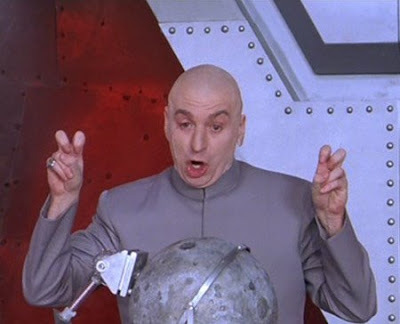 It's done with "laser" beams (make air quotes with fingers). Oh!! I love this!! Where can I get one? I just found a whole new way to piss off those angry anti-bike drivers in Stow!!! *grins evilly, massaging palms* Now I can always say, "Hey, I'm in a BIKE LANE!" if they shout their usual "Get off the road!" How well would that work when you move over for a left-hand turn? I imagine it would confuse the heck out of drivers seeing the bicycle lane moving over.